Asuna recalled about Nodoka's confession in the last ep and said that she's brave and stuff. Asuna was working and delivering papers, while doing so, she met Takahata-sensei and he gave her some goodies. Then Asuna was rumbling her drawer and drew out a sweater ... Konoka was like, isn't tat the sweater you knitted for Takahata-sensei last year? [Btw, the sweater wasn't even half done lol] Then Asuna was like, i'll confess this year for sure on Takahata-sensei's birthday. Then Nodoka was like hiding here and there from Negi, shy lol. Negi's also troubled over it. Then Asuna's making a cake ... probably for Takahata-sensei haha, it's scary to see Asuna cook ... reminds me of Naru from Love Hina but at least Naru's cooking taste good although it's ugly XP. 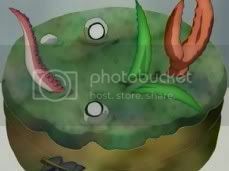 LOL the cake turns out pretty horrible ... a crab claw/octopus/eyeballs in a cake?! LoL, green in colour? Squirts red juice when cut? LoL. 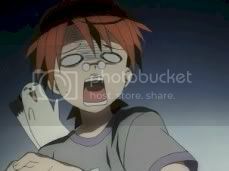 Camo fainted when he tasted [Forced-fed by Asuna] it lol. 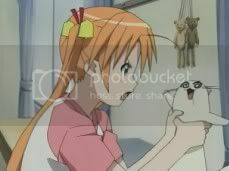 [Look at screenshot 3] And so Asuna continued making and making ... and finally she made a cake ... yeah like a cake lol. 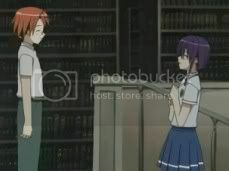 After listening to Asuna's words and her actions, Negi got out of his 'stoned' feelings and decided to reply to Nodoka's confession. 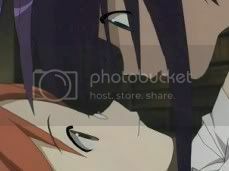 Yeah let's be friends he said, kinda like the same feeling in the manga. Then Asuna with the cake, went to see Takahata-sensei but he's away on a job. Too bad. 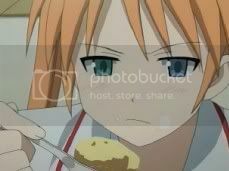 Failed~ Oh i think Konoka helped Asuna in the cake, lol in the end got show Konoka washing the dishes ... and stuff. Well in the manga, Asuna didn't make a cake for Takahata-sensei nor want to confess to him this early. Uh till #8/9 also still haven't confess to him yet le. Haha. Oh she tried in #9 or #10, not sure but then she ran away lol. Ah it's ok ep. Art's pretty ... okok. They never keep it up lol so far i find that Ep5's art is the best, it's weird that they could draw Nodoka so well but others so ugly haha. Wah Biased sia lol, a Nodoka fanboy drew this izzit?! LoL. Manz, i download alot of animes these few days but haven't got time to watch it ahaha. Loveless Ep7/8/9/10/11/12, Gokujou Seitokai 5/6/7/8/9/10, Gakuen Alice Ep8, Tsukuyomi Moon Phase Ep17/18, Naruto Ep141/142 and Gundam Seed Destiny Ep37 ... aha i'm left with only 947MB in thy lappy ... I need to watch Gokujou Seitokai tonight ... and fast ... but i wanna watch the chinese show on tv le lol, at 10.30PM haha ... that explains why i'm blogging now. Shessh. Maybe i should watch them tomorrow ... i'll watch Gundam Seed Destiny Ep37 later .. yep. Tokyo Toshokan is like having problems le ... error here and there ... shessh. Oh yeah, i downloaded Tsubasa Chronicle OST a few days ago! IT ROCKS! Manz, i love all the tracks there! Yeah! Especially A Song of Storm and Fire ... really nice so yeah it's the anime song of da day! Heh. Hmmm, wat else le ... yeah, i need to finish the data entry of at least 55 tonight ... then tomorrow i can enter another 50 ... haha ... LoL. Data entry is so ... lol funny ... for 3hrs i was like guessing what they're writing ... haha. Like is this N or U? LoL. Is this 7 or 2? Is this W or M?! LoL. Oh yeah, this has been bothering me for quite some time lol, i was sitting my dad's car home and i saw this car ... it's car plate number was SE1X lol i was like .... wat if u take out 1 ... it becomes ??? lol. Oh i bought Zettai Kareshi #5 on thursday~ Whee. It's so fast, it's ending soon at #6 ... lol till now i dunno the real ending yet. Heh. Oh my Love For Venus #11 ... i still haven't open nor read it yet lol. Oh yeah, recently i have a new hobby online lol, that is reading mandarin fanfics! LoL, i dunno how to read lemon fanfics in mandarin .... it doesn't really make sense at first ... but later .. it's pretty cool lol. It's kinda fun, can improve my Mandarin at the same time la hehehehe. PS: Listening to Tsuki no Curse Now~ Whee Type Type Type.